In May we went away with Voyages to Antiquity … Cruises to Ancient Civilisations. We were away for four weeks for the whole of May. Harriet (my wife) and I have just come back on last Friday morning at 6.00 am. from another one of overseas trips. Fortunately we had a friend of ours, Rob who lived at Morningside (about half an hour away from the Brisbane International Airport) who gladly took us to the Airport two hours before we left (his suggestion!). That meant we were not dependent on the Airport Train getting us there at 10.00 pm. = a 4 hour wait!! We flew straight to Istanbul in Turkey with a stopover in Singapore and Dubai to connect with a small ship with Voyages to Antiquity. Then he picked us up with his wife Lynne, at 6.00 am. in the morning. Unbelievable !! Harriet and I both love history and art. This not studying things out of books that other people have written for you to read and understand but it is really about actually walking through, photographing, sensing and reflecting on what you actually see in unique three dimensional ancient buildings and the art that is part of the building. Then you can then discuss with other tour members or with friends when you get home. Write about them in an appropriate way. I can then send an e-mail broadcast to hundreds friends and associates around the world through my personal experiences website at http://www.kenaitken.net/. As you may know, this website is used to personally stay in touch with hundreds friends and associates around the world. I frequently send out our personal experiences photos and then links to the website posts. We love the real sense of personality in these old buildings and their hand-madeness. This is in contrast to the way buildings are built today with their machine-like qualities: Office buildings are built out of concrete, metal and glass. Houses are built out of bricks shot out of a machine, timber of different sizes and shapes shot out of a machine as well and houses built by efficient machine – like methods to make them as cheap as possible. Harriet and I go on these trips to see things but to especially meet other people from different cultural backgrounds. One of the special things about going on a trip, is not the places you go to but the people you meet. If you did a psychological personality test like a Myers Briggs test, you would fit into one of four categories: Relating, Socialising, Rational and Managerial. We all have a primary personality style but with various combinations of all these styles. We primarily fit into the first two categories in a primary sense as these focus on people. We meet people, sometimes in unusual circumstances. Have we met them before? We get on so well ….. we have that special spark of ongoing relationships. You have meals with them or coffee in the coffee area. You then want to connect with them long-term by e-mail. These people finish up building villages, towns and cities that have similar functionality patterns to other cities in other cultures. Social groups in these places have a sense of their relationship with others. 1 + 1 is not equal two but more like __________________________ ?????. 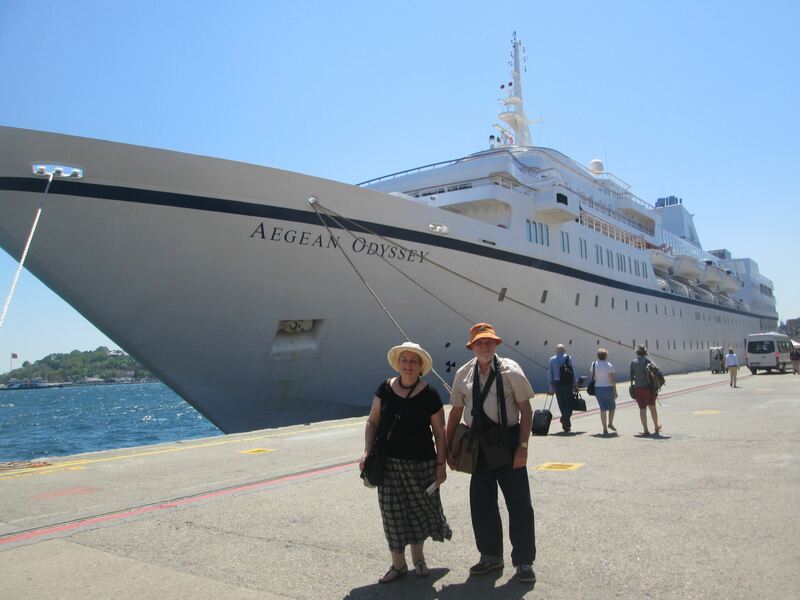 The Voyages to Antiquity website documents our daily schedule we had over 16 days. See our daily schedule: The Holy City of Byzantium. Also listen to the YouTube website on the things we explored …. it took my breath away just thinking about the things we saw and experienced! The history of the past which we do not know much about!! For example, when we reached Athens, we all went up on the Acropolis and we saw the huge Parthenon with pillars many metres high and about 1.50 metres thick, you realise this land has 2,500 ++ years of recorded history with the Parthenon being built in the 420 BC era. Australia is a very young country with only 240 years of recorded history when Captain Cook sailed into Botany Bay from England in the 1770’s. On coming home, Harriet and I stayed two days in Dubai. Whilst there our travel agent had booked us in for an experience through Arabian Adventures whereby we were picked up from our hotel and taken out into the desert on the final day. This was for a standard desert safari included a brief dune drive, access to the Dubai Desert Conservation Reserve, and a dinner, camel rides (I have photos of Harriet on a camel) and a belly dancer. I am still slowly sorting the 2,800 photographs I took of the trip into folders. (slowly: since is only four days when we got back and I have been jetlagged!) In a couple of weeks I expect to start sending out some personal e-mails on our trip.come up with the option:‘ Ópen link in a new window’. Clinking on this option should bring the photo up to full screen. NOTE: to see the text and photos in a larger size or smaller size, hold down the Ctrl button with the left hand and use your right hand to move your cursor forwards or backwards to increase or decrease the size of the print and photographs. …. We were on a small ship of 350 people only, so the ship can go into small ports that larger ships couldn’t enter …..
… Up on the Observation Deck of our ship …. You walk into the lounge and observe the outside world without being caught by the wind …. …. A very large ship moored near our VOYAGES TO ANTIQUITY Ship. It could take hundreds of passengers …. ….. Our ship from a view on the Observation deck …. looking down on the general passenger deck. 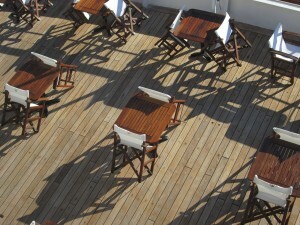 There was small swimming pool and plenty of deck chairs for enjoying the emerging summer sun in Europe …. …. This was the Reception Desk on floor three. The ship only had five levels compared the large ship shown above …. … This was the large lounge were you could sit with friends you had made over the sixteen days …. …. this was the lecture theatre that 350 people would come to once a day to hear a lecture on the sight we would see the next day. We had lectures from two visiting professors …. One in ancient history and the other in archaeology …. 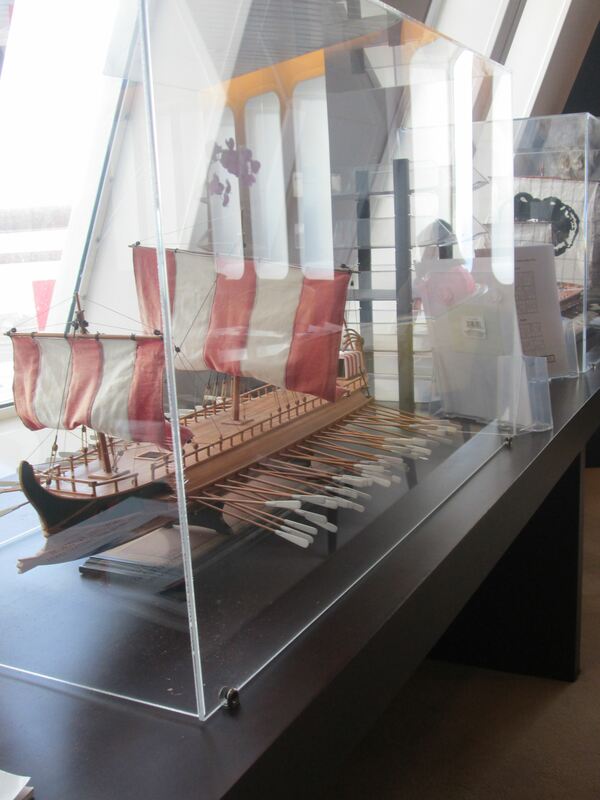 …..The door mat at each door … .‘Aegean Odssey ‘……..
Models of ancient triremes were in glass cases in the the Reception Desk area. 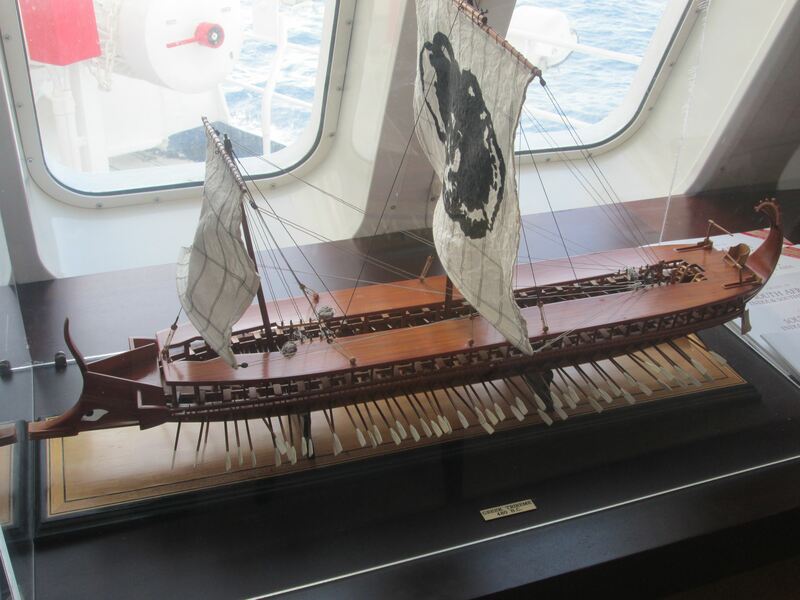 A trireme had three banks of oars and was an ancient vessel and a type of galley that was used by the ancient maritime civilizations of the Mediterranean, especially the Phoenicians, ancient Greeks and Romans. The trireme derives its name from its three rows of oars, manned with one man per oar. 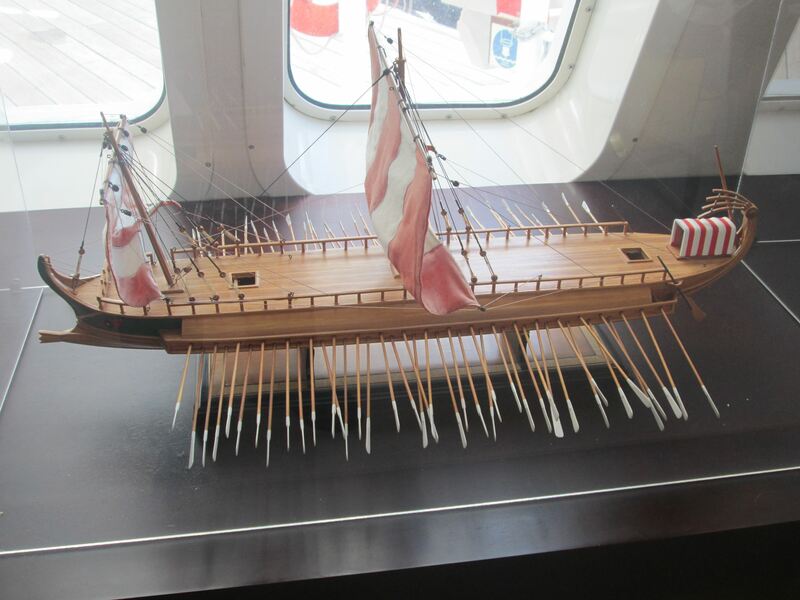 The early trireme was a development of the penteconter, an ancient warship with a single row of 30 oars on each side (i.e., a double-banked boat), and of the bireme , a warship with two banks of oars, probably of Phoenician origin, The word dieres does not appear until the Roman period. “It must be assumed the term pentekontor covered the two-level type”. 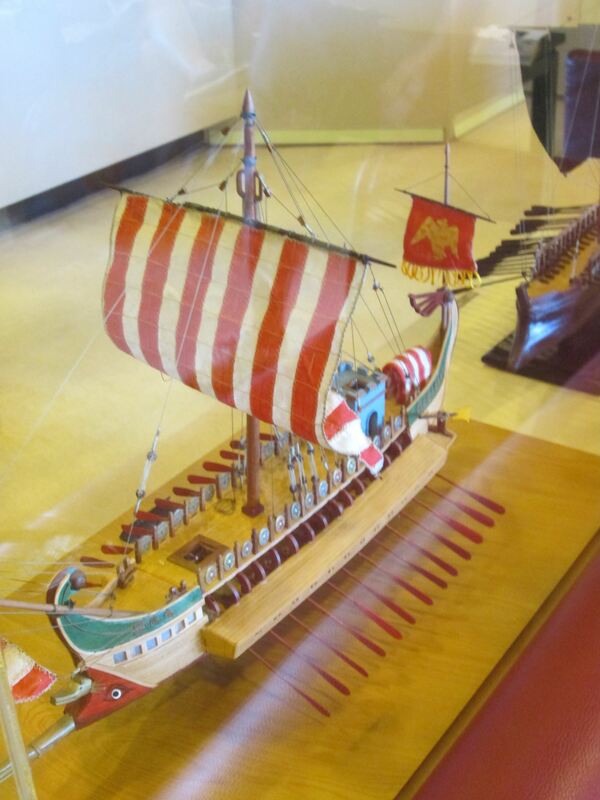 As a ship it was fast and agile, and it was the dominant warship in the Mediterranean during the 7th to 4th centuries BC, after which it was largely superseded by the larger quadriremes and quinqueremes. Triremes played a vital role in the Persian Wars, the creation of the Athenian maritime empire, and its downfall in the Peloponnesian War.